I'd been dying to make strawberry rhubarb something ever since strawberry season began this year, but couldn't quite decide what to make. Then I stumbled up this recipe posted at a new-to-me blog called Dessert First. As you know, I love a good scone so I eagerly whipped up a batch of these guys one evening this week. Using my large muffin scoop, I got about 9 scones. My husband and I polished off 5 right out of the oven, then fought over the last two the next afternoon. Just outside the frame in the picture below, my husband is hovering with plans to grab the last scone and run. Suffice to say, this recipe is very tasty and since it's lower in sugar than my other recipe, I might try this as my go-to scones dough in the future. Preheat oven to 425 degrees F. Prepare a baking sheet by lining it with parchment paper or by greasing and flouring. Whisk flour, sugar, baking powder, and salt together in a medium bowl. Add in butter using a pastry cutter (or two knives) until the mixture resemble coarse crumbs. Gently toss strawberries and rhubarb in the flour mixture. Pour in cream and fold gently until the mixture comes together. Do not overmix. You can now either turn dough out onto a floured surface, form into a rough circle about 6 inches wide and 1 inch thick, and cut into six wedges with a sharp knife. Or you can do as I did and use a large muffin scoop. 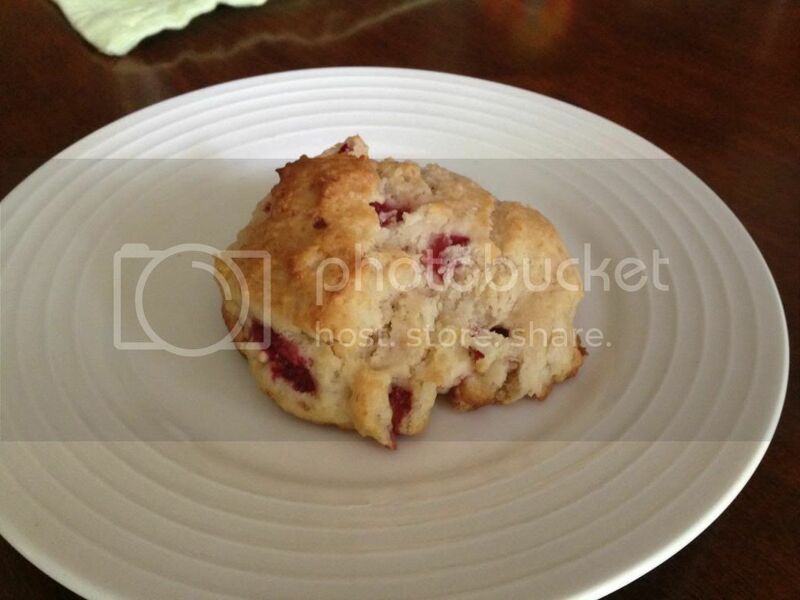 Place scones on baking sheet and bake for about 12-14 minutes, until tops are golden brown. Remove and let cool on wire rack before serving.